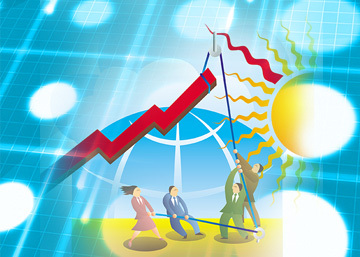 Sustaining High Energy Level | Fourth Dimension Inc. The ability to maintain high energy level in the individual and the organisation is an important factor behind productivity. This requires a clear understanding and application of the laws and principles of human energy management. This is a vast subject which cannot be discussed fully in a brief article. In this essay we can only give some brief pointers and indicators which can provide some useful hints. For sustaining the energy level in the organisation, Bruch and Menges provide many useful suggestions which are based on two core ideas: first is to focus the energies of people and organisation in strategically important activities instead of scattering them on too many projects and initiatives. The second idea is to provide employees with sufficient time out for regeneration after a burst of activity, by deliberately alternating periods of high energy with regenerating rest. At the individual level, each employee has to be educated on how to enhance his or her energy potential. In this task the Indian science of Yoga, can provide some very useful methods. According to Yoga, the energies locked within our individual human organism – physical, vital and mental are only a limited and partial expression of corresponding universal energies of Nature. We can considerably enhance our energy potential by linking our individual energies consciously with the virtually inexhaustible energies of Universal Nature.